SAN FRANCISCO - A fifth man who escaped a Central California correctional facility has been captured, authorities said Sunday. Madera County deputies apprehended Roel Soliz, 30, of Chowchilla in Fairmead shortly before 3 p.m. after receiving an anonymous phone tip, Sheriff John Anderson said. The sheriff's office declined to provide further details about Soliz's arrest, sheriff's spokeswoman Erica Stuart said. 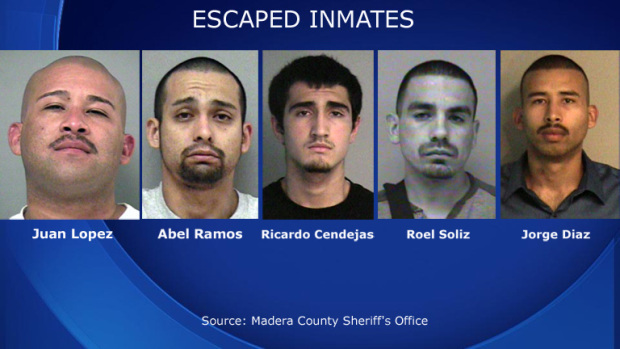 The capture came less than 24 hours after a pair of special sheriff's units caught the other four escapees - Juan Lopez, 33, Jorge Lopez-Diaz, 26, Abel Ramos 25, and Ricardo Cendejas, 19, all of Madera - late Saturday night, also following an anonymous phone tip. The men were in hiding upon their capture, Stuart said. The fugitives were being held in custody on various charges including attempted murder and armed robbery when they escaped from the county jail late Friday night. It's still unclear how the men escaped, but they were gone for about an hour before corrections officers discovered they were missing, Stuart said. The jail is operated by the Madera County Department of Corrections, she added.